Submitted by Fred on Thu, 10/30/2014 - 12:23pm. Officers Walt Frago, Roger Gore, George Alleyn, and James Pence all California Highway Patrolman who died on April 5th 1970 while conducting a traffic stop, all be it a car stop with known dangers. It was known at least one gun was brandished according to victim’s statements after an altercation on the highway. Bobby Augustus Davis and Jack Wright Twinning both violent career criminals recently released from prison and on this day were actively planning to commit a series of crimes. On this day the deadly mix of officers, offenders and circumstances would collide and leave 4 officers paying the ultimate sacrifice. This law enforcement tragedy known as the NEWHALL INCIDENT is a piece of law enforcement history and as such has taught us many lessons. The Newhall Incident was the catalyst for OFFICER SURVIVAL TRAINING and supposedly a new respect for the adversary and what he is capable of when confronted by the police. We now know that criminals are not all poorly trained and police are not all “HIGHLY TRAINED PROFESSIONALS!” Are we applying the lessons learned? Carl von Clausewitz said; “Criticism exists only to recognize the truth, not to act as judge” In this essay I do not want to critique the circumstances. 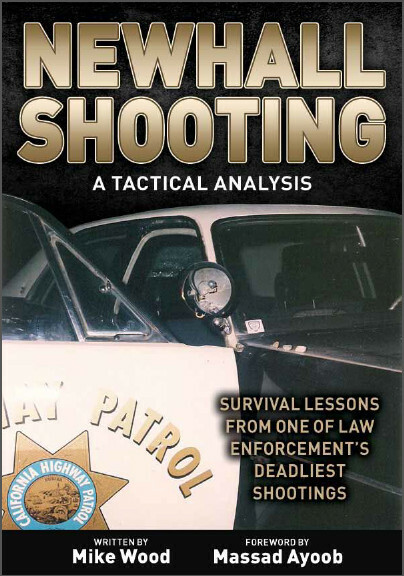 Much has been written on the topic, but this recently published book by Mike Wood “Newhall Shooting: A Tactical Analysis” is the best analysis I have read. The book covers not only the details of the situation in detail, it also discusses our level of readiness and what, if anything, have we learned and applied as it relates to officer survival nearly 45 years after this incident. To do this we must ask some critical questions to open our orientation and to understand there are many options, and not one school solution. We police need to debate enthusiastically, tactics, training and education as this helps our profession build better, more effective and safer (not risk free) options. Mike Wood opens this discourse with this fantastic book. Critical questions asked, thought about, synthesized, analyzed and answered help us get to the root causes police misfortunes like Newhall. We learn how to think fast and slow and will be more able to structure strategic and tactical issues in real time and adapting them as circumstances require. Collaboration on development and realization of solutions to the complex tactical dilemmas police face both technical and adaptive challenges. “We can’t just look at our present experiences or use the same mental recipes over and over again; we’ve got to look at other disciplines and activities and relate or connect them to what we know from our experience and the strategic world we live in.” What Col. John Boyd is getting at in the above quote; is we must always question ourselves and our methods. We must resist doctrine which all too often becomes dogma. The tactical analysis in this book helps us to do just that, learn from our past and apply the lessons to the street. CHP actually used the word “Newhall” as an acronym identifying lessons learned to remember during traffic stops. I believe they are worth every police officers time. Not a checklist but as tactical options based on the unfolding conditions and interactions of offender, officer and circumstances. N-Never approach a danger situation until you are adequately prepared and supported. E-Evaluate the offense and determine if you might just be dealing with something more dangerous than it looks. H-Have a plan (in other words, don’t just wade into a situation without planning every move). A-Always maintain the advantage over the opponent. L-Leave the scene when in doubt. The Pathways of misfortune from the Newhall Incident have been written and talked about for 45 years now. Yet still today many of those killed in the line of duty perish from the same mistakes being repeated again and again. There are three basic kinds of failure say Elliot Cohen and John Gooch; in their book “Military Misfortunes” failure to learn, failure to anticipate, and failure to adapt. Each has its own characteristics and consequences, as well as its own parallels in the world of everyday life. (Cohen, 1990, 2012) We must absorb these readily available lessons at all levels, in our strategy, operations and, tactics as they play out in the moral, mental and physical dimensions of conflict. Anything less means we have lost an opportunity to learn and apply the lessons and hence fail to eliminate the pathways to more misfortune. Newhall Shooting A Tactical Analysis by Mike Wood is a book that will help[ create and nurture our ability to adapt and win on the street. I highly recommend this book!